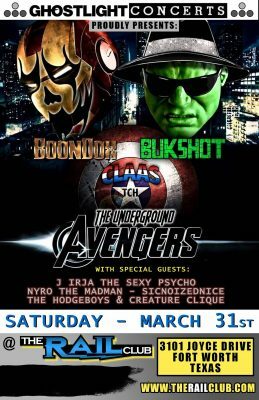 Radio420™: The Underground Avengers (Boondox, Bukshot, CLAAS) Reunite for One Night in Fort Worth, TX! 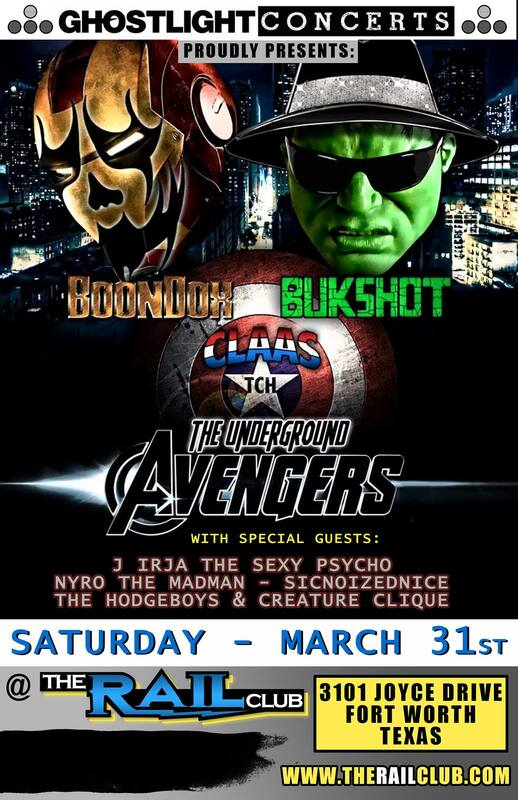 The Underground Avengers (Boondox, Bukshot, CLAAS) Reunite for One Night in Fort Worth, TX! For those who don’t know about The Underground Avengers, they are a rap group consisting of three heavy hitters in the underground! Those MCs are Boondox, Bukshot, and CLAAS. They first came on the scene in 2012 when they hit everyone by surprise by dropping a 10 track EP at the Gathering of the Juggalos! It made a lot of noise, but unfortunately, there hasn’t been much activity with the group for over 5 years. Our homie Nyro has helped put together something that should be nothing short of amazing when the Underground Avengers REUNITE in Fort Worth, TX! For One night only, CLAAS, Bukshot, and Boondox will perform as UGA at The Rail Club on Saturday, March 31st! If you’re in the area, or want to spend a weekend in the Dallas/Fort Worth area and catch a killer lineup, make sure you get your tickets to this show ASAP! You can get them for $15.00 in advance, or $25.00 at the door! For advance tickets, reach out to https://www.facebook.com/NyroTheMadMan/ on a Facebook DM! I know I’m planning on being there! Hope to see YOU there too!